Director J.A. Bayona (The Orphanage, A Monster Calls, The Impossible) ramps up the fear factor in the fifth installment of this very popular sci-fi action-adventure film franchise as familiar characters and some new ones return to the Jurassic World amusement park for a special rescue, which later turns into primal survival as dinosaurs and heroes work against dark forces. Colin Trevorrow (Safety Not Guaranteed) and Derek Connolly (Kong: Skull Island) both return to write this sequel’s screenplay (second installment of a trilogy) while Steven Spielberg acts as executive producer along with Trevorrow. 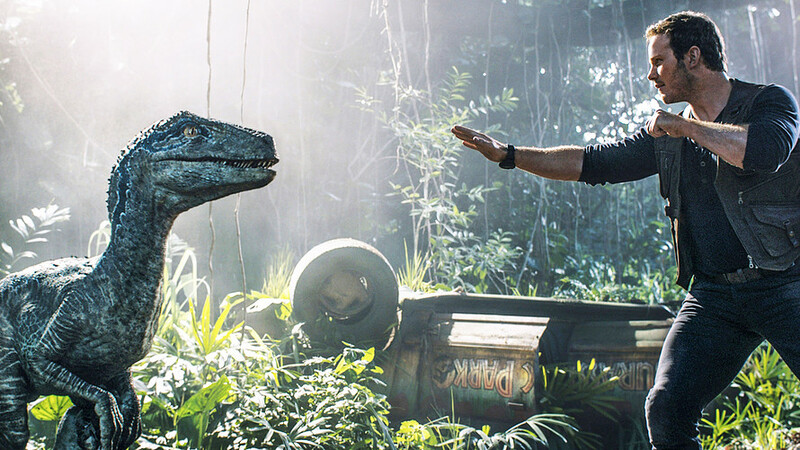 The next Jurassic World installment scheduled for June 11, 2021 with Trevorrow scheduled to return as director. Based on the characters created by Michael Crichton. The first half of the screenplay addresses a current crisis. The Central American island ((120 miles west of Costa Rica) named Isla Nublar is now abandoned. This former amusement park (that lasted about 10 years under Simon Masrani) is still home to many dinosaurs as a dormant volcano threatens their lives. The second half unpacks a hidden agenda among some truly frightening, life-threatening situations. John Hammond, played by the late Sir Richard Attenborough, initially developed an amusement park with actual dinosaurs regenerated through genetic technologies. Now his goal lives on through his remaining partner, Sir Benjamin Lockwood, played by James Cromwell, who has entrusted operations to Eli Mills, played by Rafe Spall (The Big Short, Life of Pi). Cromwell’s accent could have been more distinct, but filmmakers wisely make it subtle, so it does not distract from the important and vital scenarios playing out. 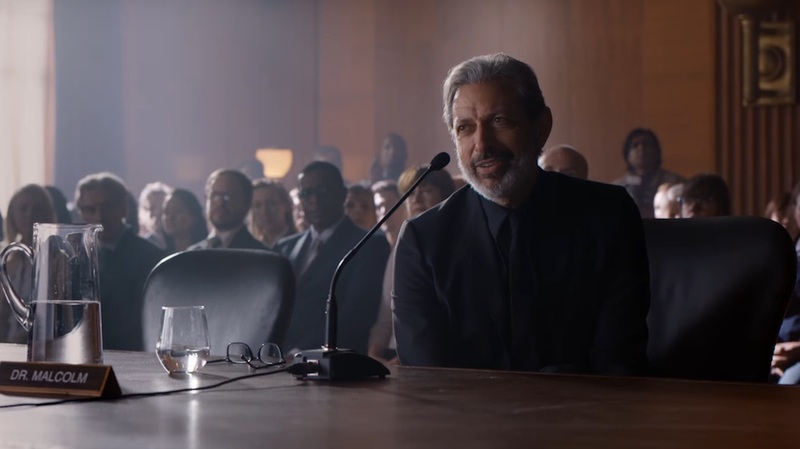 Jeff Goldblum makes a welcome return as Dr. Ian Malcolm to help audiences understand the “big picture” implications during some special government hearing sessions. “Genetic power has now been unleashed. You can’t put it back in the box.” Goldblum gets several memorable lines like this one and brings various views as a highly respected subject matter expert/chaos theory expert. Bayona and his filmmaking crew display impressive skills that result in great continuity, character development, some surprises, several references and satisfying closure…to some issues that might be resolved in the next installment. 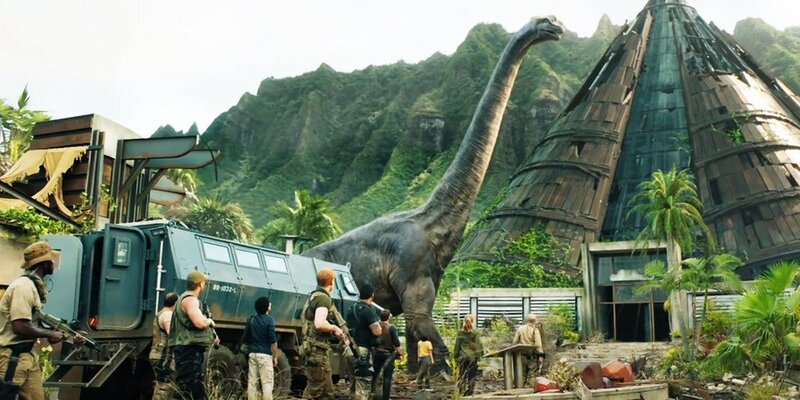 I wondered why the flying dinosaurs didn’t just leave the island after breaking free from the armored aviary in the previous installment Jurassic World, but I guess they needed their food source. 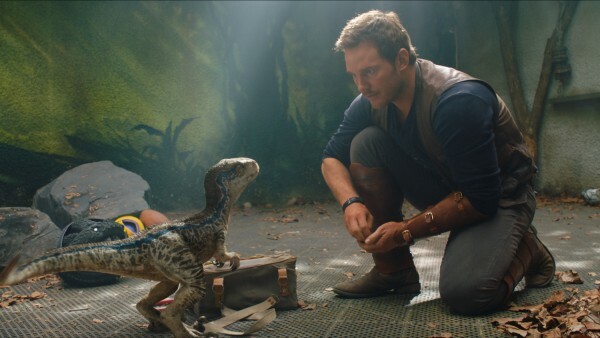 Owen Grady and Claire Dearing, played by Chris Pratt and Bryce Dallas Howard, return to rescue the dinos, especially Owen’s favorite Velociraptor named Blue. Filmmakers set up the plot well with memorable character introductions (“We’re not compatible,” Franklin says to Owen) with some amusing job title exchanges, then the emotions build among the rescuers and their frantic race against time. The audiences really get to feel the emotional results and just the raw feeling of survival then terror sets in as the heroes address several threats as other dinosaurs’ survival hangs in the balance. Claire’s previous role as the park’s operations manager combines with her current work at the Dinosaur Protection Group. She brings along two of her co-workers on this rescue, systems analyst/tech expert Franklin Webb and paleoveterinarian/former Marine Dr. Zia Rodriguez. Franklin, well played by Justice Smith (Paper Towns, The Get Down series), bridges the action best with the audience as a relatable, yet capable character with good intentions and realistically emotional reactions that fit the situations very well. Just say the word “system” and Franklin is on it. Zia, played by Daniella Pineda (The Detour series), backs up her tough talk and performs actions crucial to the plot. There is one sequence that needed revamping where audiences might have a hard time understanding her when she makes a special request. Other notable characters include Gunnar Eversol, played by Toby Jones, veteran mercenary Ken Wheatley, played by Ted Levine (Monk series) and Lockwood Estate housekeeper/nanny Iris, played by Geraldine Chaplin, who is also the nanny to Maisie Lockwood, played by Isabella Sermon in her impressive, and likely star-making acting debut. She gets terrorized a lot throughout the plot, but holds her own and greatly enhances the emotional events with her performance. B.D. Wong returns as geneticist Dr. Henry Wu who continues his “creation lab” work. His genuine care for this work and love for science overcomes any greed or selfish motives as he provides a key voice of reason among the increasing chaos. This time audiences get a lethal lab creation called an Indoraptor as the ensuing scares and thrills really push the boundaries of the PG-13 rating. The top-notch sound, special effects, lighting, set design and cinematography combine into an involving, fascinating experience. The constant thunder of the volcano punctuates the clear and present danger on the island as Bayona increases the fear factor combining several methods like graphic matches (toy riding horse to actual dinosaur), well-timed lighting flashes and creepy shadows into incredible results. Filmmakers also include a great interior sequence involving an exhibit and the Indoraptor that reflects a complete role reversal that began with Jurassic Park, which helps progress the plot to a very different scenario by the film’s end. A key antagonistic human character vehemently justifies their abhorrent actions as the human hero characters show impressive trust in each other to conquer the daunting challenges using sacrifice, risk-taking and selfless action. The most cheers from the audience were for the protagonist dinosaurs with Blue being a special favorite thanks to some past video footage of her and Owen. The rag-tag dino crew charms the audience as they meld into a roving community. Music score composer Michael Giacchino (Up, Inside Out) produces another excellent musical score that includes main themes from John Williams’ classic Jurassic Park musical scores. Giacchino continues to channel Williams’ work again just similar to composer John Powell’s work on the recent Solo: A Star Wars Story. Giacchino previously composed musical scores for two Jurassic Park video games as well, so this Oscar-winning composer is a great fit for this special effects-filled film. Filmed in the Hawaii and the United Kingdom, the scenery combines well with the animatronics and computer-generated imagery (CGI). The 128-minute Jurassic World: Fallen Kingdom comes recommended (*** out of four stars) and rated is PG-13 for intense sequences of sci-fi violence and peril. Be sure to stay and watch the bonus sequence during the ending credits. Also showing in 3D and IMAX 3D theaters. This entry was posted in 2010s Film Reviews, Film Reviews and tagged Dinosaur, Film, Jurassic Park, Jurassic World, Michael Siebenaler, Mike Siebenaler, Tall Writer. Bookmark the permalink.